A cooling yogurt side dish that is perfect when served alongside spicy curries, biryani and rice pilafs. 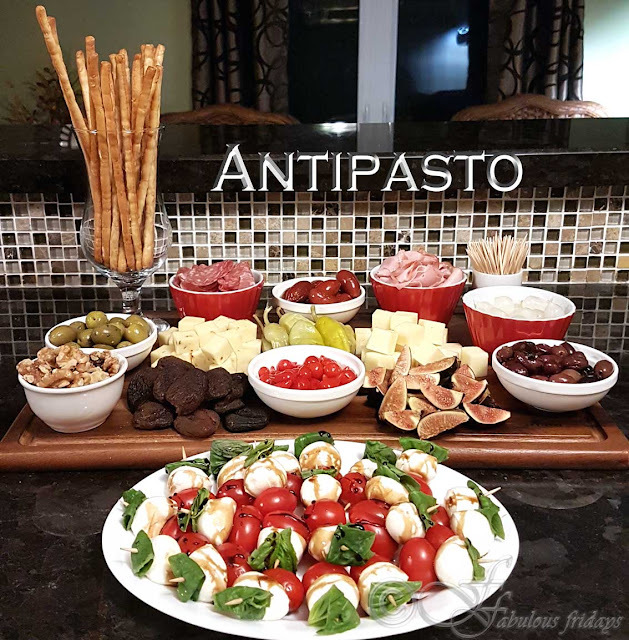 Makes for an excellent snack and a healthy dessert as well. 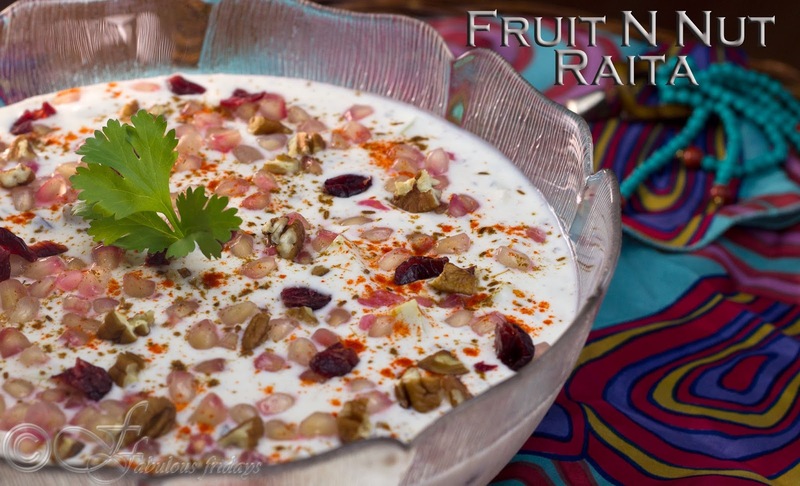 The beauty of this very simple dish is in its combination of textures and balance of flavors - tart yogurt, soft and crisp fruits, nutty and crunchy walnuts. You can use any fruit and nut combination you fancy for this dish. 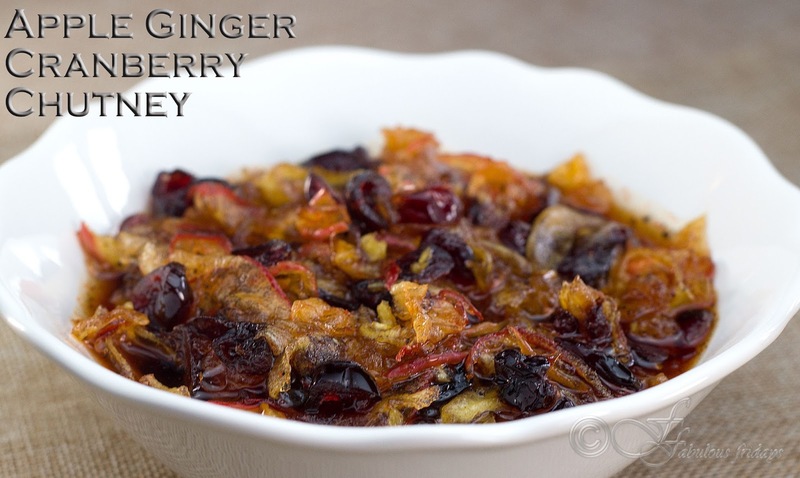 This version includes cranberries and walnuts along with apple, banana, pineapple, grapes and pomegranate pearls. Chop all the fruit into small bite sized pieces. Add the fruit and nuts along with all the spices to the whisked yogurt. Spice measures are just a guideline. Use them as per your taste. Mix well. Taste to get the perfect salt-sugar and spice balance. Garnish with pomegranate pearls, walnuts and cranberries. Serve cold. 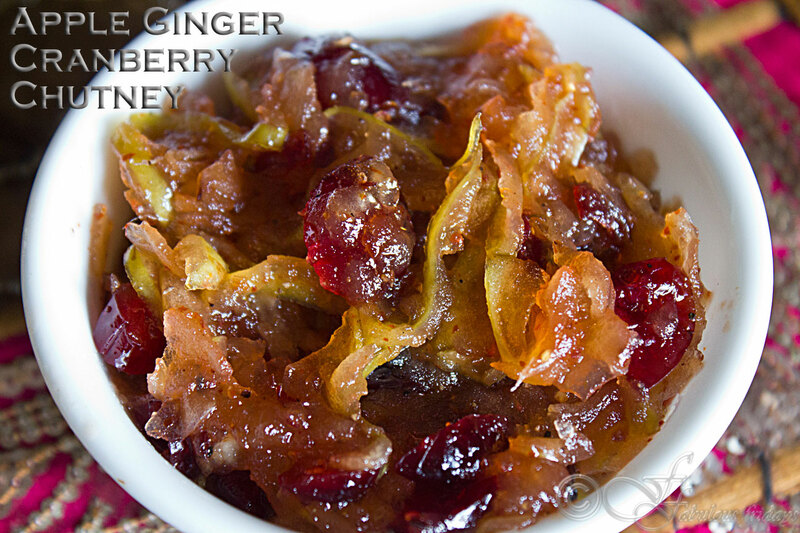 Chutney is a versatile spread/condiment that is usually associated with Indian cuisine. Chutney could be sweet, spicy, tangy depending on its main ingredient and could be made of herbs, fruits, veggies, dry fruits or a combination of one or more of these. Most chutneys have similar ingredients, fruits or veggies, sugar, salt, spices and vinegar/acid and these all balance out to adds flavor to whatever it is served with. This one is a simple combo of apple and ginger. I prefer to add cranberries, but you can use raisins as well. Quarter apple, slice away seeds and core. Use a vegetable peeler to make apple shavings(with peel). Put all the ingredients in a pan and bring to boil. Simmer and cook on medium, stirring continuously, till the fruit softens up and the chutney becomes syrupy and a little thick. Do not overcook as it thickens considerably as it cools down. Kanji is a nutritious traditional Indian mocktail made with the simplest of ingredients. 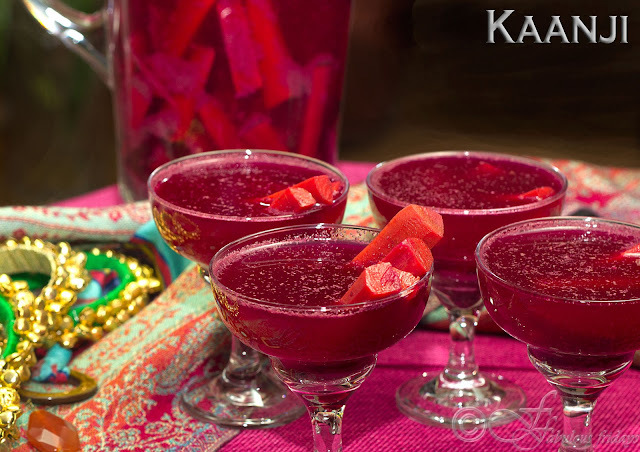 This fermented drink has a tangy flavor and a beautiful pinkish red color - a perfect drink for Holi festivities. I remember my mom making this drink with black/dark purple carrots which were only available in the market during the winter-spring months. 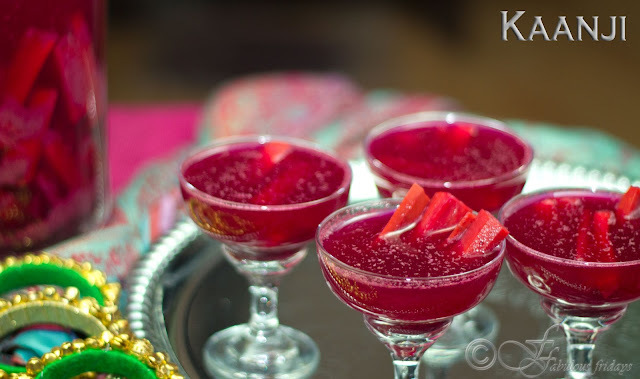 These contributed to the lovely color of the drink. Since black carrots are not available here in Canada, I have used a combination of red carrots and beets. This probiotic drink aids in digestion and its sour salty flavor is certainly unique (an acquired taste for sure). For kanji you need to combine carrots, mustard powder and salt in a large glass jar with lots of water and keep this concoction in a sunny spot for several days. Time required to ferment and develop the flavor depends on the temperature in your house. It will take anywhere between 3 to 7 days, or more if its colder. In India the jar is usually kept outside in the sun during the day and kanji fully ferments in 3-4 days during the winter spring temps. Here in Canada, I made this drink at the peak of winter. So leaving it outside was not an option. I kept it in the oven with the light on for 3 days and that did the trick. You will need a large glass jar or container for this recipe. Peel carrots and beets. Cut into long batons and put them in the glass container. Add 12 cups of water and salt to taste. Grind the mustard seeds into coarse powder. Add it to the above mixture. Mix the contents well and cover. Keep the container in a sunny spot and stir the contents every day with a wooden spoon. Taste the liquid periodically to see if its ready. Once the kanji develops a tangy flavor, your drink is fermented. Strain the contents and refrigerate the liquid to chill. Also refrigerate the pickled batons and enjoy them with food later or serve them as garnish in the drink. As it sits in the refrigerator, further fermentation takes place at a slower pace and kanji will get more tangy and yummy. Keep refrigerated. This exotic starter is an absolute treat for the vegetarian foodie. The meaty texture of lotus stem is a perfect substitute to any meat. 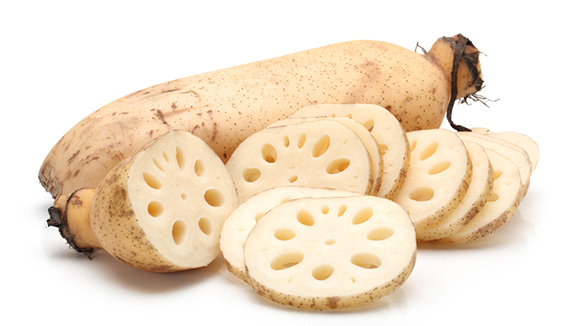 Also called nadru or kamal kakdi, lotus stem has a mild sweet flavor and is liberally used in the Kashmiri kitchen. The bold flavors are that of fennel, ginger powder, cardamom and asafoetida while a gentle heat comes from the Kashmiri chili powder. Make sure the mashed up nadru is not watery, or the kababs will break on frying. If you feel the mixture is not binding well cook in in a pan to evaporate the moisture and add some dry roasted beasn. Wash the lotus stems well. Peel and slice into 1/2 inch thick slices. Wash again. Cook in boiling water till tender about 15 minutes. Or pressure cook for 5-7 minutes. Once the stem starts to turn lighter in color and can be smashed easily on pressing, consider it cooked. Drain, cool and mash well. In a pan heat 1 tbsp oil and add pinch asefoetida. Add the sliced onions and fry. When they turn a little pink add the ginger, garlic and green chilies. Continue frying till onions turn light golden brown. Add the roasted chana dal and all the spices listed under 'dry spices'. Roast stirring continuously for a minute. Remove from heat and cool a little. Grind this mixture till you get a coarse powder. Add this powder to the mashed lotus stem along with salt, mint and lime juice. 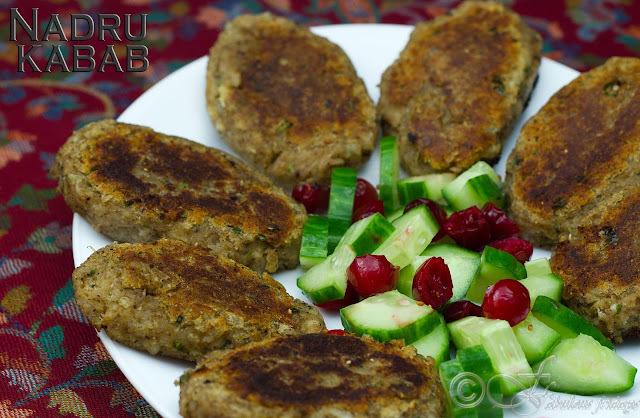 Mix thouroughly and shape into small kababs. Shallow fry or deep fry till golden on all sides. Serve hot. This delicacy from the Kashmiri kitchen is made with minced mutton, yogurt and a bunch of aromatic spices. 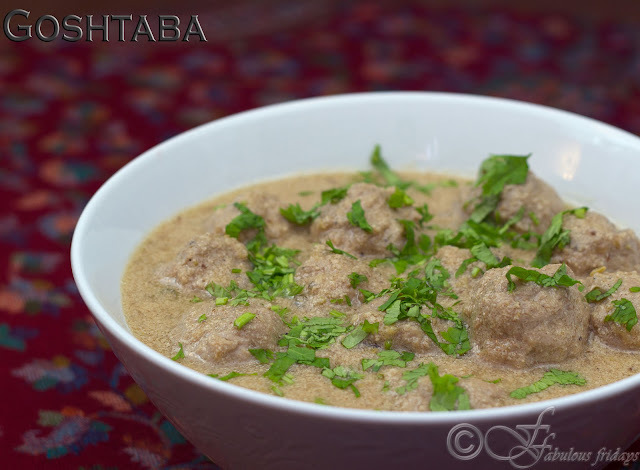 It is basically spiced meatballs cooked in a flavorful yogurt gravy. An important dish, Goshtaba is made on all the auspicious occasions and is the last meat dish to be served in Wazwan (the multi - course Kashmiri feast) just before the dessert. While preparing this, make sure to pound and knead the mince well with the extra lump of fat. This pounding and mixing makes a big difference in the texture of the goshtabas and the fat lump keeps it moist. Traditionally it was beaten with a wooden mallet on a smooth surfaced stone and meat fat was added to it while pounding. Use of spices such as fennel, Kashmiri red chilies and dry ginger , are specific to Kashmiri cuisine and give this dish a unique flavor. Make meatballs - Combine all the ingredients under 'for the meatballs' and mix well. I would recommend grinding them in your food processor to get a fine texture. Take out the mixture in a bowl and using your hands knead it well. Shape into walnut size balls and keep aside. Cook meatballs - In a pan put 2 cups of water, and add the whole spices to it. Bring to a rolling boil and gently slide in the Goshtabas (meatballs). Cook on high for 15 minutes till the water evaporates to half and the dumplings are spongy and done. Take out the goshtabas and discard the whole spices. Reserve water for the gravy. Make gravy - Heat the oil and ghee in a pan and stir fry the chopped onions , till light brown and translucent. Do not over brown. Remove, cool and grind to a smooth paste. Return to the pan. To the onion paste add whisked yogurt, reserved water and cook on high stirring till it starts to boil. Add all the spices listed under gravy along with some salt (remember meatballs are already salty). Combine the two - Float the Goshtabas in the gravy, bring it back to boil and then simmer uncovered for about 20 minutes till the gravy reaches the desired consistency.